When I used to think about Rhode Island, I never thought, “Should go to the beach there for my next vacation.” So imagine my surprise when I learned that it’s the “Ocean State.” Yes, there are actually 400 miles of coastline on the Narragansett Bay in the Atlantic Ocean. Seems to me that’s quite a feat for a state 37 miles wide and 48 miles long. Close to the bay there are the quaint villages scattered about. Looming high above the bay are legendary mansions with spectacular views. And along the shore, where you can hear the lap of the water, see the foamy wakes of watercraft of all sorts, and smell the salt air are the cottages such as you’ll see here. This cottage was completely remodeled and yet the owners paid homage to its history and the tales it could tell from the “old salts” it housed. 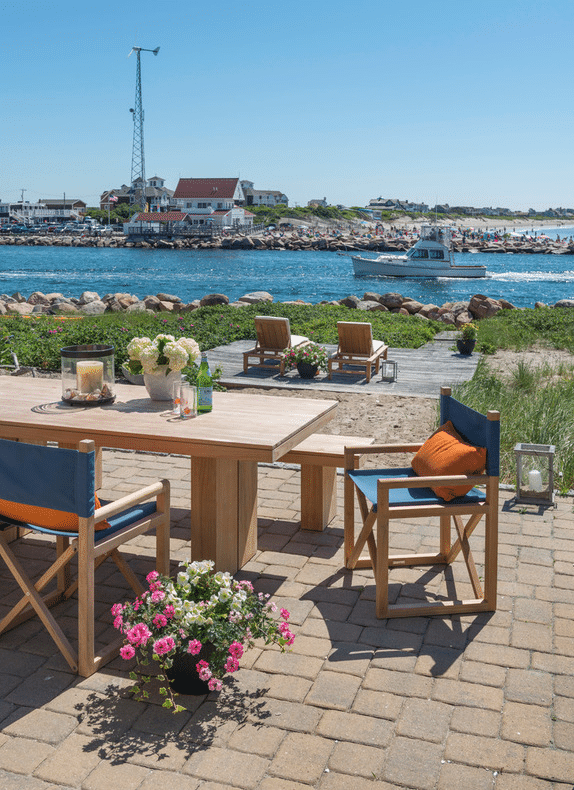 The outdoor furnishings are as natural and relaxed as the scene they look upon. The table, matching bench and chaise lounges are stylish and durable. The style comes from the sleekness of the contemporary lines. The durability from the teak wood. The Indonesian teak planks are unfinished so that the teak’s natural oils give the surfaces a lustrous patina. The teak cleans easily with soap and water, weathers any element and resists warping, splintering, insects—anything that a beach environment can throw at it. The chaise lounges are specifically designed to be comfortable even without cushions. From this perspective, we see the open floor plan where once there were walls. The Colonial-style kitchen cabinets are a throwback to the cottage’s history, while the Cornice Hanging Lantern is absolutely today. 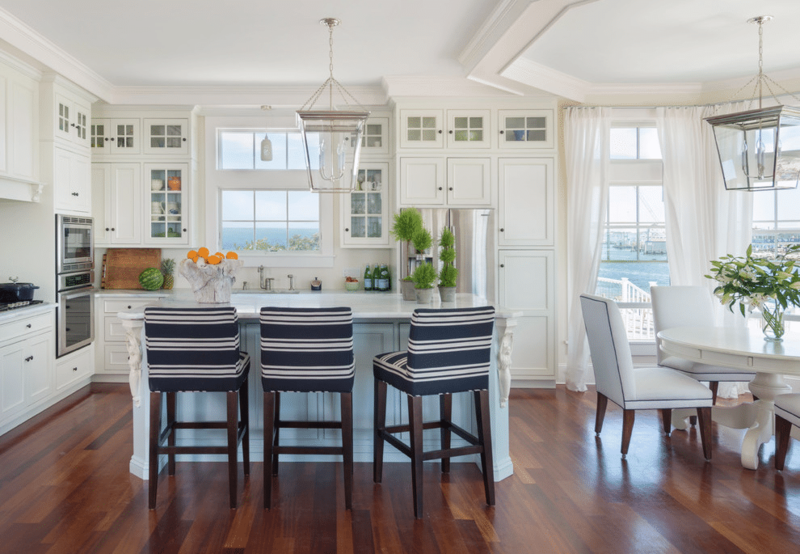 Notice the antique-looking mermaid cobels on the kitchen island, while the counter stools are covered in the latest indoor/outdoor, easy-to-clean fabric. The dining nook has a larger version of the lantern hanging in the kitchen area, so that the lighting fixtures are coordinated without being repetitive. The round pedestal table is sailboat white and Bailey side chairs are pearl with brass nail detailing. 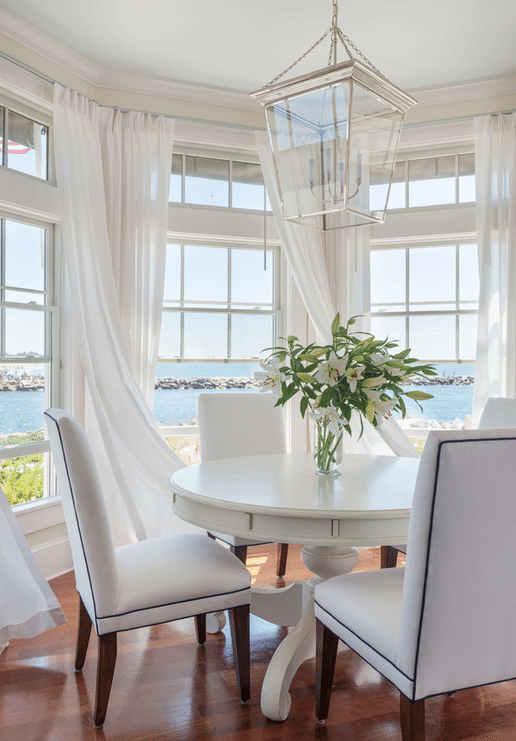 The curtains that appear to be so delicate are actually made from the sturdy indoor/outdoor fabric. The plank ceiling is another nod to the home’s past life. The Colonial doors hiding a flat screen TV may win “Best Merger of the Antique with State-of-the-Art.” If we had such an award. The sofas and chairs are soft and elegant and designed to be lived in with the indoor/outdoor fabric. The coffee table is an upholstered ottoman, and the teak “stump cylinder” stool in the foreground is being used here as an end table. “Twofers” are great additions to any décor. Not only because they save space but because it’s a fun exercise in creativity to think up what items you can repurpose. 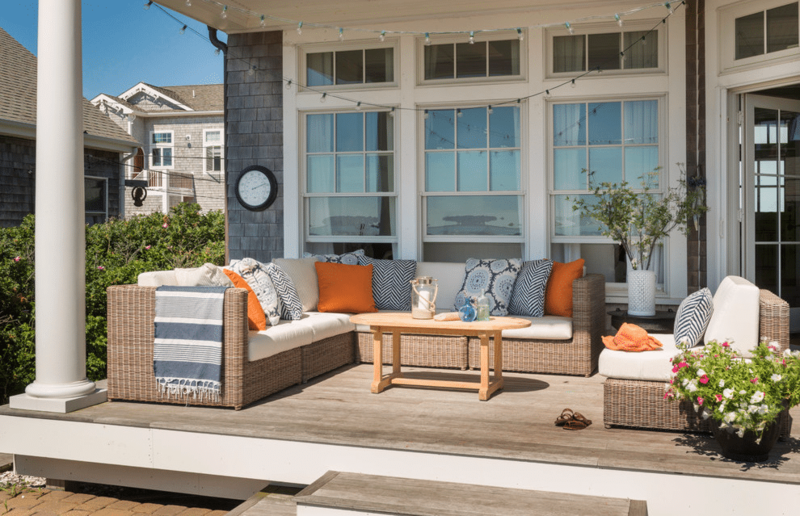 We’re back outside on the deck furnished in all-weather wicker with rust-resistant frames and with height adjusters that level the furniture no matter how uneven the surface—a particularly clever idea for wood surfaces at the beach. We had to show you this Frog Rain-Drum table. Be the first in your crowd! The table is made from cast aluminum with a dark bronze finish. They are called “rain drums” because of the lovely sound when raindrops fall on them. Look for botanical motifs on the sides and frogs on the top. The décor in this home is a thoughtful and clever blend of early New England and the styles and conveniences available today. The owners did not have to clear away all vestige of the cottage’s early life in order to have a comfortable, modern home. And elegance does not have to be impractical.